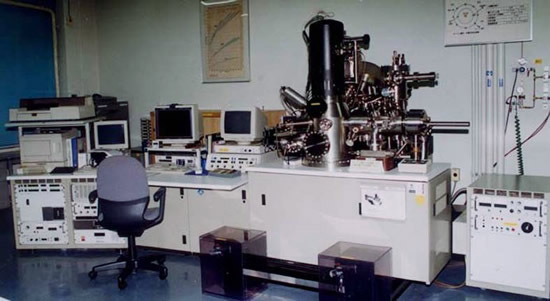 [Auger electron spectrometer, X-ray photoelectron spectrometer] Daido Bunseki Research Inc. Principle The surface of a sample is irradiated with electron beams, and element-unique electrons are emitted from the sample (Auger electrons). Energy from those electrons possesses an element-unique kinetic energy, and the spectrum of this energy is measured for element analysis. When X-ray is irradiated into the sample surface, the emitted photoelectronic kinetic energy is measured, and information regarding atoms and molecules which make up the surface, as well as chemical bond, is obtained. (2) Diffusion and adsorption of elements on solid surface are clarified.